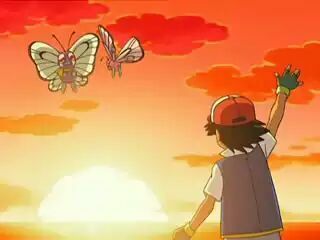 Since the start of Pokemon Go, I have become a bit of a Pokemon professor of sorts, playing the game and watching the anime. What started as a way to understand what my patrons were interested in became something I myself was interested in. There's a particular episode of the anime where Jigglypuff, who always carries a microphone and tries to sing his song to anyone he sees, has his microphone stolen by a Snubbull. Jigglypuff spends the rest of the episode trying to get his microphone back. 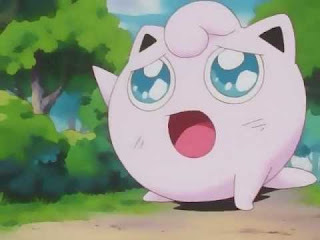 I can relate to this Jigglypuff. Nearly nine months ago, in a plot twist I certainly didn't see coming, I was asked to resign from my children's librarian position. I spent eight months like that Jigglypuff, trying to find another position, trying to understand how something I loved so much had been taken away from me, trying desperately to reopen the door that had been slammed in my face. One of the things I did during that time was to keep this blog rolling. It was hard to enter the library as a patron and not a staff member and to read books and review them when I knew that I was doing so in the hopes of getting a new job instead of to help me with my current job. Eventually, after literally hundreds of applications and dozens of interviews, I gave up. My spouse and I actually relocated to an entirely different state because I had been stonewalled by all the potential library positions where we were living. I was able to find a position doing a thing that I can do, even if it isn't the thing I had come to love since I graduated with my MLS five years ago. So this blog, into which I have poured so many of my hours, will no longer receive the attention it has for so many years. I still read, and if you run into me in person I will gladly talk with you about books, but I can't see devoting so much time to a platform only reminds me of what I've lost. For those of you who have followed my reviews and posts, thank you for sticking around. I won't deactivate the site, so feel free to send your friends to the posts with free downloadable forms or posters or whatnot. But don't expect any new content any time soon. I've decided to focus my energies elsewhere. Meriano, Anna. A Dash of Trouble. Walden Pond Press, 2018. Leonora's family owns a bakery, and leading up to Dia de los Muertos, they are extremely busy getting ready for the holiday. Leo is the youngest of five sisters, and she can't understand why she is sent to school instead of being allowed to stay home and help prepare for the event. 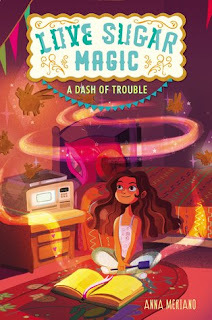 When she sneaks out of school and returns to the bakery, she discovers that she is part of a long line of brujas, kitchen witches who can bake magic into their food. But her mother still thinks she's too young to begin learning magic, so Leo studies on her own, with disastrously hilarious results. If you have watched and enjoyed the show Just Add Magic, this is the perfect series for you. Leo learns the consequences of trying things without proper instruction/experience, and as she adds more spells to undo the results of previous spells, things compile and become even more complicated. This is an adorable and precious story with lots of Spanish language and Latinx culture added to the mix. Recommended. Cherry, Alison. 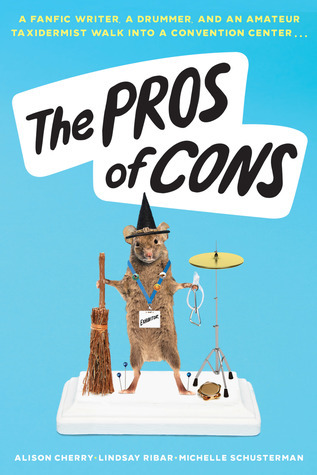 The Pros of Cons. Point, 2018. Phoebe is a drummer and is really looking forward to this year's percussion conference and competition with her high school percussion group. Vanessa is excited about WTFcon, because she's attending as a fanfic writer and gets to meet her girlfriend IRL for the first time. Callie assists her father in his taxidermy business, and she agreed to go to the taxidermy convention with him in the hopes of having some father-daughter bonding time. These three conventions are happening at the same convention center, and the protagonists meet and get up to all sorts of hijinks and shenanigans. This book is unbelievably hilarious. I started reading for the queer content, but they had me hooked when the Snape impersonator ran through the building in grey undies, twirling his robe above his head and screaming about putting a dark mark on Orlando. Each of the main characters has her own personal drama to deal with, and they end up becoming friends and helping each other (and a little pageant queen named Beige, but I don't want to spoil things for you). The characters are fun and relatable, the humor is splashed across every page, and once again I have found a book that my spouse and I each read in one sitting because it's just that good. Recommended. Ormsbee, K.E. 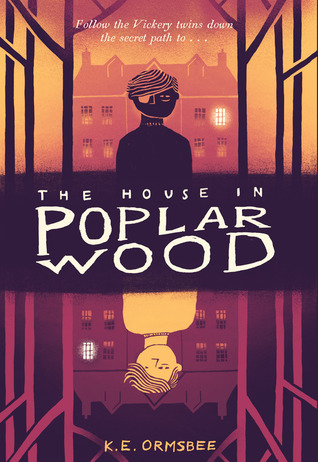 The House in Poplar Wood. Chronicle Books, 2018. Lee and his mother live in one half of their house and together serve Memory. Felix and his father live in the other half of the house and together serve Death. Felix has no memories of his mother, while Lee has never met his father. The twins can interact outside of the house, but when they turn sixteen they, too, will be apprenticed to Death and Memory for the rest of their lives. But both are looking for a way to break the contract. 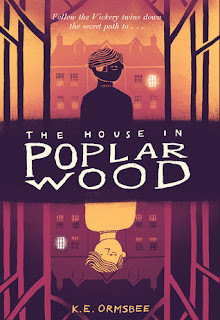 This is a delightfully spooky and eerie book, perfect for this time of year. The world the twins inhabit is similar to ours, but the differences, including the service to Death, Memory, and Passion, are well thought-out and explained throughout the story. The characters are well-rounded and likeable, so the choice for multiple narrators doesn't hold the typical problem of lack of distinct voices. There is plenty of humor and some intense action sequences, and the plot twists will keep readers turning pages to find out what happens. This book would make an excellent middle school read aloud at this time of year. Recommended. Annable, Graham. 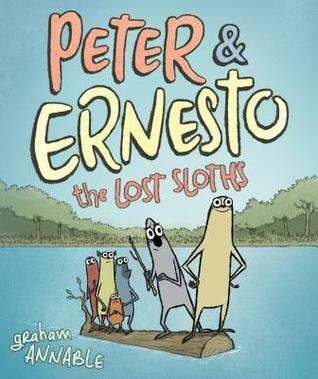 Peter & Ernesto: The Lost Sloths. First Second, 2019. Peter, Ernesto, and their friends lose their tree home in a hurricane, so they set out to find the perfect new tree. This is an adorable graphic novel with simple text and plenty of humorous adventure, perfect for middle grade readers.